Encouragement can be helpful or hurtful, constructive or destructive. It gives people courage to do something, even if that something isn’t positive. What kinds of encouragement are you giving others? What kinds of encouragement are you inviting and allowing others to give you? We often hear how terr orists are hitting “soft targets,” or at least, they carry a high risk of being attacked. They’re those everyday situations, so they don’t feel too “soft” to us, living everyday life. And if we’re honest, they aren’t “soft” to a terrorist either. After all, there’s as much intent to harm regardless. Sure, fewer people might be involved, but numbers really don’t make an attack better or worse. An attack is an attack. Pain and suffering is pain and suffering. Scare tactics are scare tactics, and death is death. The target is pretty much always the same. People see our culture (or another) as a threat to their lifestyle and ideology, and they will do anything to attack, threaten, and take it down. They cause harm, because they see harm being done to them. It sounds odd, because we might not have any personal interactions with people who seem to hate us so much. We feel distanced from them, but they make assumptions about us and us about them, which only helps that feeling of distance. It also helps us generalize. People justify some really bizarre things. We can try to understand motivations without respecting or approving of them. In fact, when we don’t try to understand, we’re actually at more of a risk, because we’re only preparing and responding to the possibilities based on our generalizations (and often our fears). We have more responsibility than we want to embrace at times. We need to ask questions, help fix misconceptions, and trust God more than we trust our own preferences, comfort, social media posts, or friends’ opinions. Just because something sounds good doesn’t make it true. Lesson from Nature: Help or Harm? How does a woodpecker that has a beak with a pretty small tip make that kind of a hole? One peck at a time. We can do a lot of damage, one peck at a time. We can also make huge strides, one peck at a time. We need to know which we are doing…destroying or constructing…because sometimes it’s difficult to see the difference. 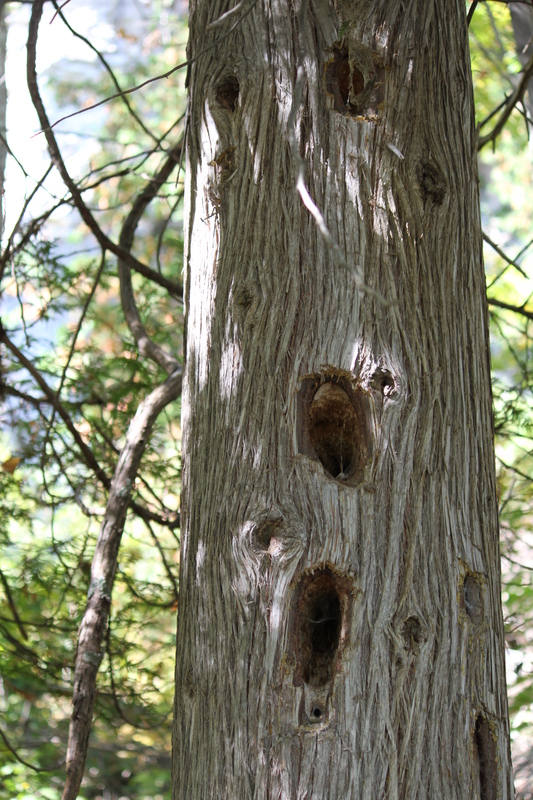 Is the woodpecker harming the tree, or is it creating a place to live? Yes. Both. What are you doing with the choices you’re making on a daily basis? Think about the things you do over and over. What is that repetition accomplishing? Is it something helpful or harmful? Is it helpful for you but harmful to others, or vice versa? Don’t convince yourself that you can’t accomplish much, either harm or help, with the small, insignificant choices you’re making. It doesn’t take long for a series of small, insignificant choices to have big, significant results. The buzz among those who are travelling by air for Thanksgiving seems to be the looming boycott of TSA screening. A timely topic for me, since I just flew to and from Israel, experiencing heightened security not only in the airports but also on the ground in Israel. On the ground, soldiers were everywhere…but not on guard as you might expect. 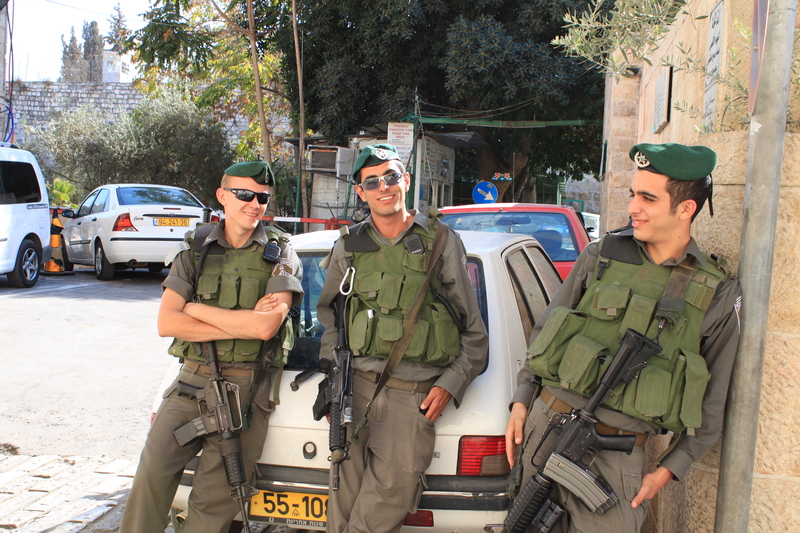 Since military service is required for both young men and women in Israel, there are troops just about everywhere – many of them on “tours” of area sites. Kind of like field trips for elementary school children. 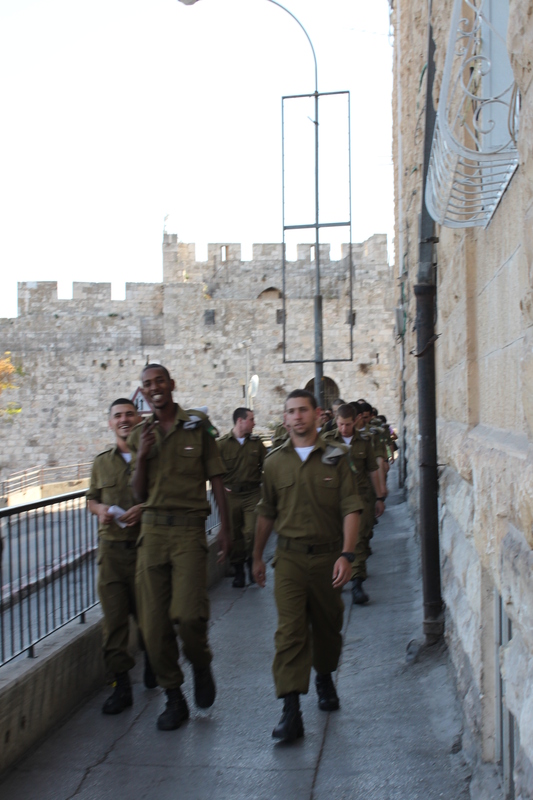 Soldiers learn about their cities, people, and history by experiencing them. 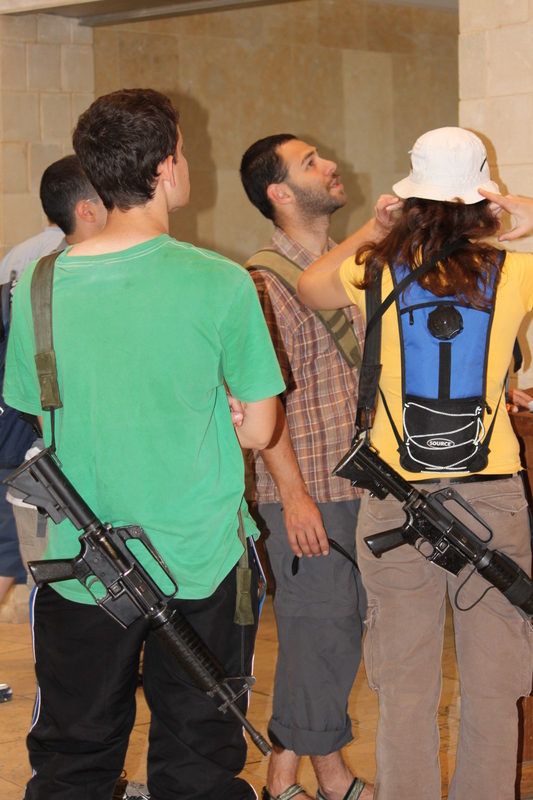 This group was in the Old City in Jerusalem, where we often saw military touring. Sometimes on duty. I was perplexed to see another group at Masada. Out of uniform but with guns. I later saw this same young woman sitting in the shade on a rock on Masada – with her gun slung on her back while she knitted! It seemed odd to me, but it’s a way of life in Israel. We went through many checkpoints while driving throughout Israel. We walked across the checkpoints after visiting Bethlehem, which is Palestinian-controlled. We walked through metal detectors to enter the mall and other large department stores or areas. But…I never felt threatened. (Okay, the exit from Bethlehem was a bit nerve-wracking – but for other reasons. Perhaps a future blog post.) Being the leader of the group, I felt responsible and was always aware of what was going on around us. So if anyone would have felt threatened, it likely would have been me. The Ben Gurion (Tel Aviv) airport was the most thorough airport security I’ve ever experienced. Even through the long lines, lifting my bags up and down on conveyor belts, opening my suitcases and shifting everything in them, emptying every bag of all electronics, and answering a wide array of questions, I didn’t feel interrogated or offended. I didn’t feel my rights were being infringed upon. I felt a bit more safe. Perhaps a lot more safe. A statement I don’t think I’d hear in the States. Don’t get me wrong. I’m not saying I want to throw all sensitivity out the window. I’m not saying another country handles security better than we do or has all the solutions. But I wonder if our demand for personal rights gets in our way. What’s the cost of our arrogance? If it makes you feel better, I’ll turn it on myself. What’s the cost of my arrogance? When do I expect or demand to be treated a certain way…but in the process negatively impact the process others must go through or their rights or security? What is security? I wonder if we often think of security as “what’s most comfortable and convenient for me.” If that’s the case, how will we reconcile our “security” conflicting with someone else’s? Let’s not blur the lines. Security and rights or preferences aren’t the same thing. Security does not equal safety. Security is freedom or protection from fear and anxiety. It doesn’t insure no harm comes to you. It’s a vigilant position. It’s not pulling a “security” blanket over your head and hiding. In that case, “security blanket” is an oxymoron. Security is taking the blanket off, keeping your eyes and ears open and watching for anything out of the ordinary…not just for you but for everyone else. Not to be paranoid but to be attentive. The ultimate security you can have has nothing to do with your safety. You might be safe here on earth, but are you secure – for eternity? God’s the best security blanket you’ll ever have. And he never covers his eyes.